I am a super busy mom of four and I drink a lot of coffee. I love the taste of an amazing cup of coffee on a cold winter morning. It is one of life's simple pleasures! 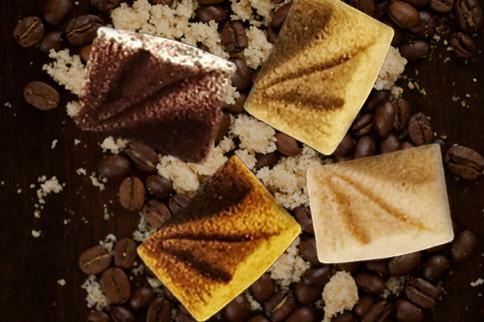 Javamelts is the perfect quick addition to your favorite coffee or tea. Javamelts are flavored sweeteners available in four varieties; mocha, french vanilla, caramel and hazelnut. The brown is mocha, the darker almost yellow is caramel, the white is french vanilla and the cream colored one dusted with brown sprinkles is hazelnut. Their portable, discreet packaging make Javamelts perfect for on the go. I have a few currently stashed in my car now. I drink coffee anytime it is fairly cold out and it is winter here now. I often go with a cup of coffee just sipping on it to keep warm. I freeze in the winter. I tried Javamelts and was pleasantly surprised most sweeteners have an off artificial taste. Javamelts just taste great in coffee and are pretty true to flavor. You can actually taste the caramel, mocha, hazelnut and sweetness of the french vanilla in your coffee after adding Javamelts in your preferred variety. I love a mix of two Caramel and two French Vanilla. It makes an amazingly refreshing caramel coffee flavor and is perfect for cold mornings! The Display Box is what we received priced at $45 and includes 14 in each flavor Javamelt for a total of 56 ships free when you spend $30 or more. So your shipping would be free. I recommend purchasing the Display Box because it truly is a display worthy gift. My Javamelts are placed right by our coffee pot. 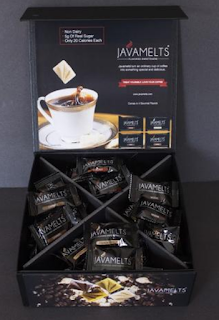 Javamelts Display Box has the best packaging and is perfect for gift giving! Give as a family or office gift or treat your sister who loves coffee. The Javamelts Display Box is the perfect gift! These sound great. My son would like to try these.